Ligaments are a fibrous connective tissue that stabilize bones. The ligament of the forearm is called an interosseous membrane. It is a strong, but flexible, ligament that connects the radius and the ulna–the two bones that make up the lower arm. The interosseous membrane increases stability between the two bones but also allows for pronation–twisting of the lower arm. The interosseous membrane of the forearm can be divided into three parts: the central band, accessory bands and proximal interosseous bands. There are other interosseous membranes in the body, including the ligament that connects the tibia and fibula bones of the lower leg. The bones in the forearm are the radius and the ulna. In anatomical position, or with the palm facing up, the radius is situated furthest from the body. The ulna lies parallel to the radius and is closest to the body. You can remember the position of the two bones by repeating: “The radius radiates away from the body." The radius is the primary arm bone that contributes to the wrist joint. The ulna contributes largely to the elbow joint where it articulates with the humerus, or upper arm bone.The radius and ulna are held together by two joints where they meet at the top–near the elbow joint–and the bottom–near the wrist joint. They are also held together by the interosseous membrane. Ligaments are connective tissues that always attach bone to bone. Their purpose is to provide stability to the skeletal structure of the body. The forearm ligament lies between the radius and ulna, connecting them along their length. It can be broken down to three parts, though it is one, flat ligament. The main part is the central band. The central band’s origin is on the radius and attaches to the ulna obliquely–or in a diagonal direction. The central band is very strong. The second part is the accessory bands. These consist of one to five bands that are less strong and support the central band. The final proximal interosseous bands share a point of origin with the central band but run in an opposite, oblique direction. The interosseous membrane of the forearm adds strength to the arm but is arranged in such a way to allow rotation. When the lower arm twists–a movement called pronation–the radius crosses over the ulna making an “X." Since the radius carries the wrist, the hand follows the movement of the radius and turns palm down when pronated. The movement of pronation is a unique movement of the forearm. Try pronating your lower leg to turn the sole of your foot toward the ceiling! Tears or strain to the interosseous membrane can result from injury to the arm. 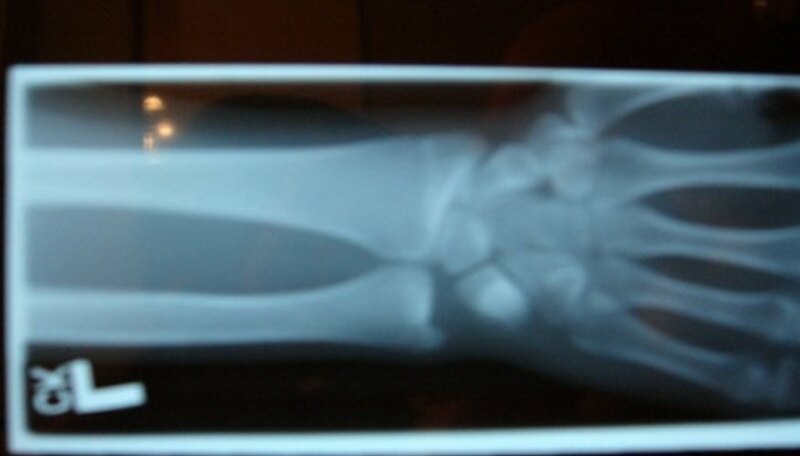 Usually, an injury with enough force to damage the ligament will also cause a fracture to the radius or ulna. Sometimes, the injured ligament is not diagnosed because the bone damage is more readily seen and treated. However, if ligament damage is not mitigated, long-term pain, decreased motion and forearm instability may result. The lower leg and arm are constructed similarly. The lower leg is also composed of two bones: the tibia and fibula. These are connected by two joints where they meet at the top and bottom of the lower leg, just like the forearm. The same fibrous interosseous membrane also connects the two bones down their entire length. However, the lower leg functions much differently than the forearm. The lower leg has less movement in the tibiofibular joints–where the two bones meet. In the arm, the joints between the radius and ulna have more movement. The decreased rotation at the tibiofibular joints helps to withstand the stresses of carrying the body’s weight, whereas the flexibility of the radioulnar joints facilitates dexterity. Schnurman, Kristen. "Anatomy of the Ligaments in the Forearms." Sciencing, https://sciencing.com/anatomy-ligaments-forearms-6403645.html. 25 April 2017.